April 18, 2016 - PPC Technologies & Solutions LLC (PPCTS) and Huizhou Degang Machinery (DGM), in a joint technical development, are unveiling two new SMARTFOLD™ SERIES folder gluers for folding carton and light corrugated board applications. The new SMARTFOLD 1100SL - ULTRA™ folder gluer will be unveiled at the PPCTS demo center during a pre-DRUPA open house event that will be held weeks of May 9 and 16 in Waukesha WI, and the new SMARTFOLD 1100SL - SERVO X™, will be unveiled at the DRUPA Exhibition at booth 11/D41 in Hall 11 in Dusseldorf Germany. Both new Smartfold™ folder gluer models are equipped with advanced state of the art technologies for fast job changeover, with the ULTRA™ focussed on mutli-type work capabilities with medium-long to shorter run lengths in mind and the SERVO X™ on higher speed applications. PPCTS having further expanded their new demo center in Waukesha WI, will showcase the new DGM Smartfold™ 1100SL ULTRA™ Intelligent folder gluer with a Baumer HHS gluing/inspection system and the IMPACK ERGOSA™ PERPACK™ Universal Folder Gluer Packing system, at the upcoming open house, as well as for private customer demos, testing and training. 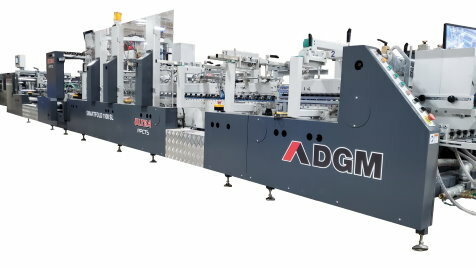 The new DGM Smartfold 1100SL ULTRA™ will be equipped with motorized carriers that include full and sectional job/memory recall, a new "universal multi-function section" with integrated "bump & turn", new servo drives technologies, back folding system, extra length crash lock and final folding, and able to produce complex carton structures, straight line, auto-lock bottom, 4 & 6 corner cartons and more. Richard McDonald, President of PPCTS, noted, "The unveiling of the two new SMARTFOLD SERIES folder gluers are a testament to the joint technological efforts and commitments by PPCTS and DGM to offer the industry an affordable, cost effective and complete state of the art solution for the folding and gluing needs of today's converter and market demands, two of the best cost/value/productivity equipment combination to be offered to the industry". The PPCTS demo center is located in Waukesha WI and available for customer demos, testing and training. For more information or to schedule your visit to the PPCTS, May 9 - 20, 2016, OPEN HOUSE DEMO CENTER DAYS and/or the DGM and IMPACK lines of folder gluer equipment, please contact PPCTS at 262-695-7536, sales@ppcts.com or visit their website at www.ppcts.com.